The last couple of days have been ideal painting days with warm temperatures and low humidity. I was able to paint the 8 hatch reefer previously mentioned as well as prime a tank car model and the CN mechanical reefer. 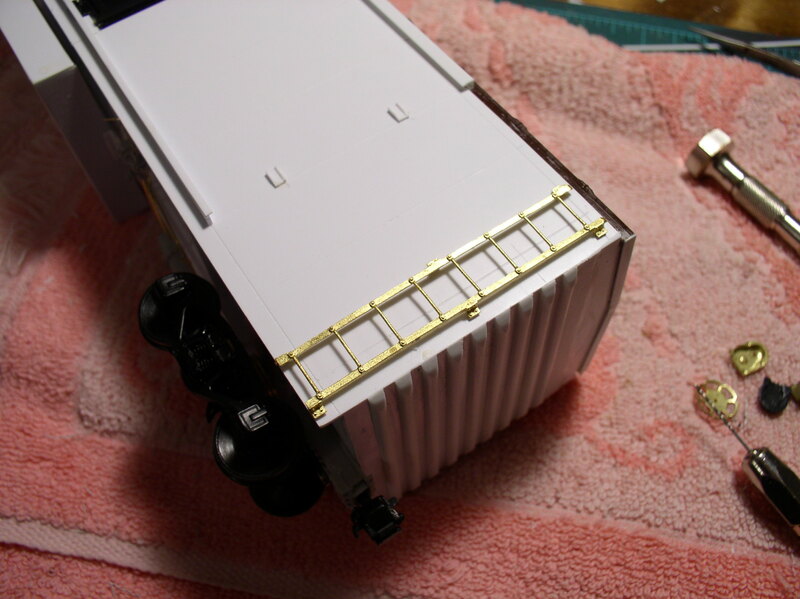 On the 8 hatch I added a line of rivets over each door. It was my first experience with Archer decal rivets and the application went well. They are now sandwiched between two primer coats. The tank car I’ll talk about at another time, but last evening I began the rivet application on the CN mechanical reefer. This is going to be a labor of love, considering the immensity of the project. Thank goodness I am only doing one. The car ends are made up from a series of individual stamped horizontal ribs that are in turn riveted to each other all the way across. For the ends alone, that is quite a few rivets. I have found that holding the model in a soft vise makes the work much easier because it frees up both hands. In this next view you can see the rivets. Once both ends are completed, I will move to the sides. Both sides are different. One has a screen panel on the end where the refrigeration unit is. The other side has a sliding panel that allows access to the unit for service. The panel itself and the car side above it have louvers. I will be using Archer louver decals to simulate those details. The real challenge however will be to add the rivets that join each side panel to the next one. The prototype photo illustrates what’s needed to model this unique car. Should keep me out of mischief for some time to come. Thus far the alignment of the rivet strips on the end were easy because I could center them in the corrugation grooves. When I get to the sides I am going to try placing thin tape along the vertical seams and then sliding the wet decals over to just touch the tape. This makes a little fence to work against. To apply I dip the decal strip in distilled water and then remove it and wait maybe 30 seconds. This allows the decal to thoroughly wet out and be ready to slide into place. Once the decal is in place and dried a bit, I then apply Micro Sol to soften the decal and adhere to the surface. Then it will be all about repeat, repeat, repeat……. One of the nice advantages of this railroad hobby is that we can have a number of very different projects in motion at any given time, at least I do. It gives me fresh interest everyday and if I need to wait for parts or materials, I simply move on to something else. Today I finished hanging the black cloth above the photo backdrops. This dead black space helps to keep the eye from wandering into an area where there is nothing to see. Later in the overall plan I will be using the color black for the fascia and the lighting valence. This will put the railroad itself in sort of a large viewing box. Although I didn’t use black before I did have the same effect with the color gray on my former layout. I have also begun to form the raised road behind the north end of Calais Yard. 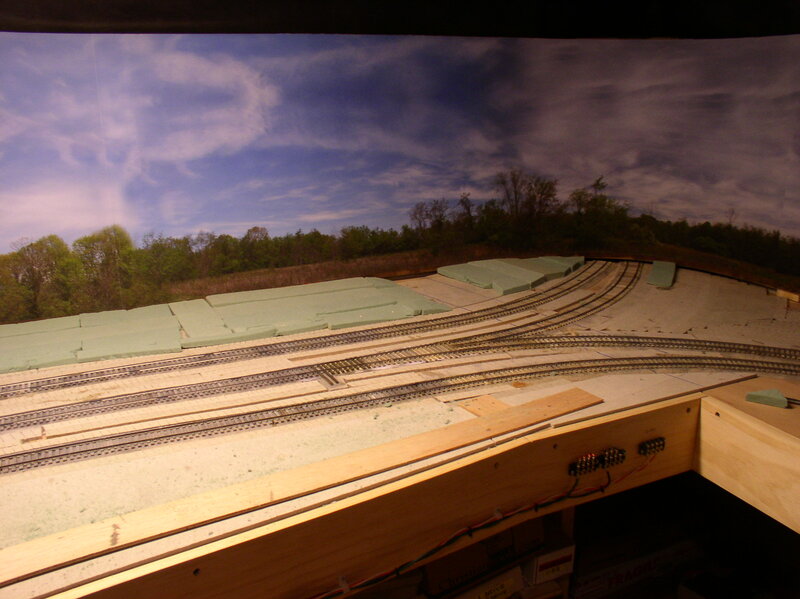 This is a scenery portion I can spend some time on with out getting in the way of track work and ballasting. I’m using a combination of rigid pink foam and some areas of green florist foam. Most of the structures for this area have been completed for quite a while and have just been waiting for installment. I have found that having a small but more completed area, helps visitors to gain a better perspective of my final objectives. Otherwise, it’s pretty hard to have an appreciation of the final product while looking at bare track work. As I indicated in the above paragraph, I also like the opportunity to break away from spiking, to say, plant some grass. 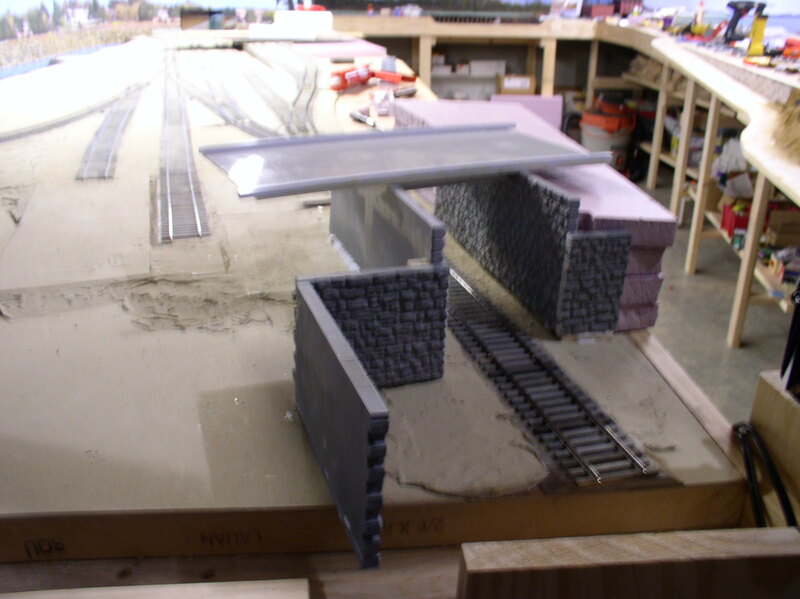 Main Street overpass and retaining walls. The beginning of Union Street. More forming of Union Street. 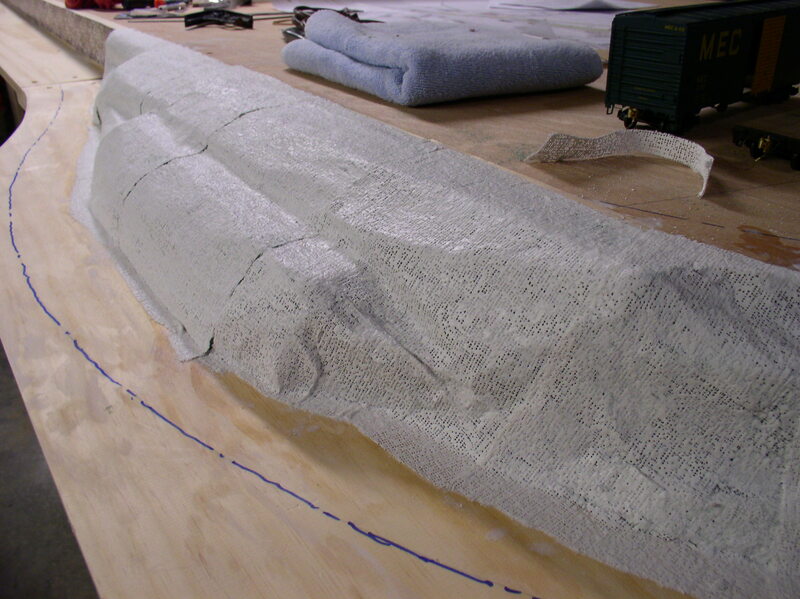 Eventually the foam will be carved into the final shape and be draped with plaster cloth and then ‘Ground Goop’. This final view shows Main Street extending toward the St. Croix River and then curving north to meet the border crossing at St. Stephen, New Brunswick. The center track is for the engine house and the shorter track beyond is for fuel oil delivery for the diesels. 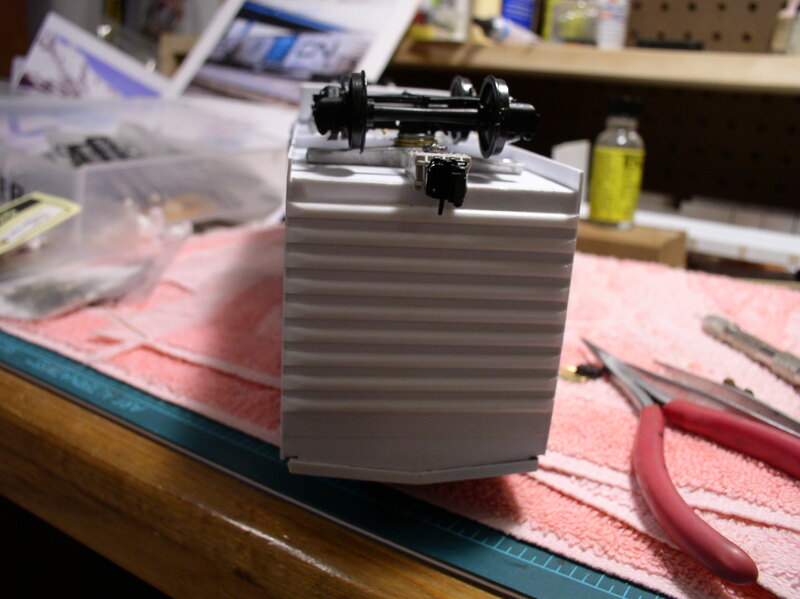 This week I wrapped up this short period of model building, primarily because I have to wait to do the painting. My spray booth is in an unheated garage and like many areas this week around the country we also have had below freezing weather. So, I have to wait until things warm up. 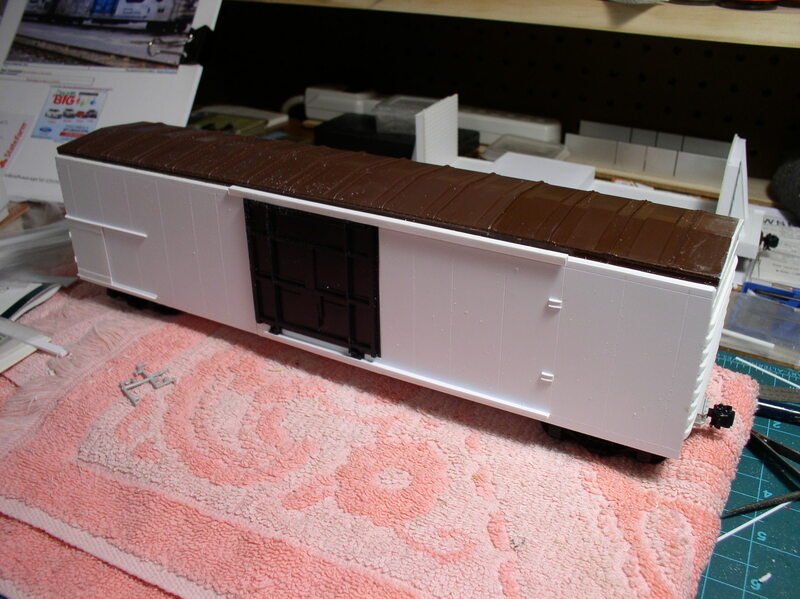 During this period I have gotten two CN refrigerator cars and a brass tank car ready for painting. I have also partially completed a wood refrigerator of the ‘meat’ variety. These models used a spectrum of different techniques and materials. One reefer was a kit bash and the other scratch from styrene. 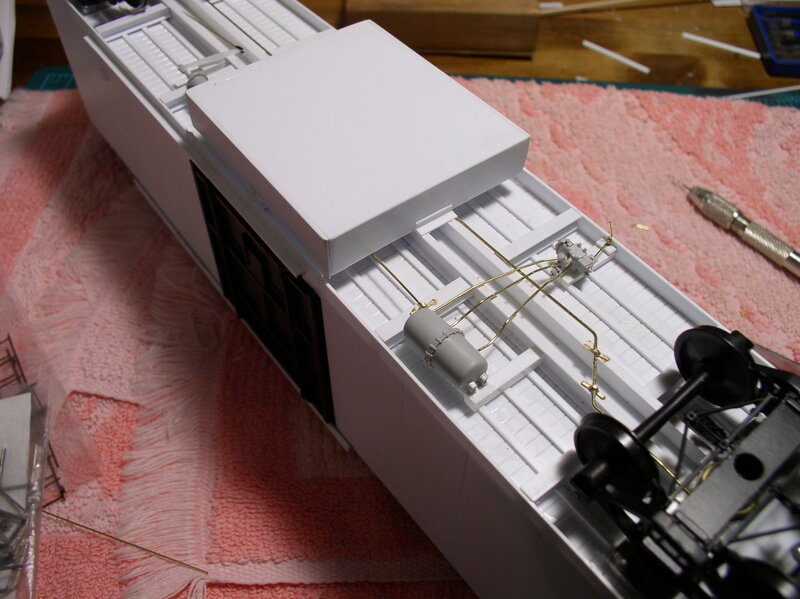 The tank car is brass and had some additional detail work added in the form of a platform around the dome. 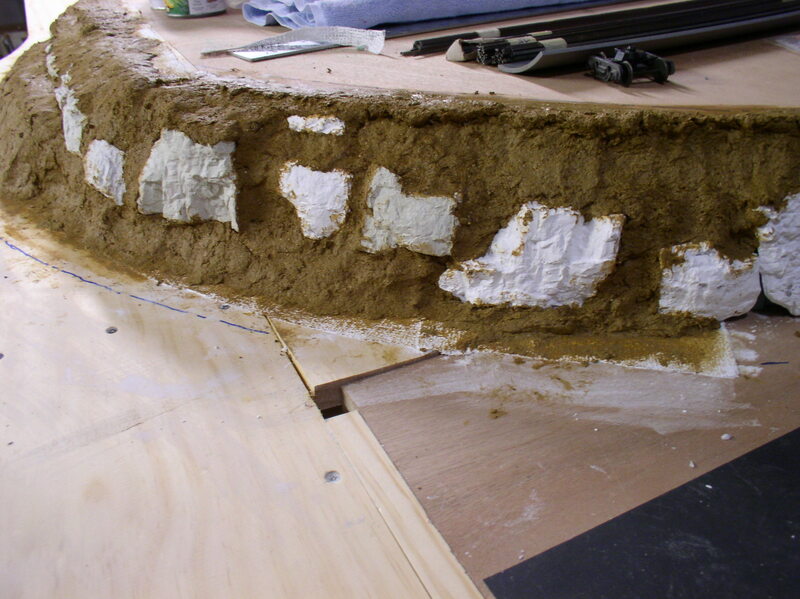 The work was fairly straight forward and made easy with readily available materials and commercial detail parts of all types. Then today while looking for some project files in my library, I happened across an old, but very favorite book. It has reminded me quite often when I come up against a challenge that there are ways to overcome whatever it is. The book is rather old now, having been first published in 1941. Those were the early days of WW2 and all hobby parts and materials were either scarce or not available until after the war. 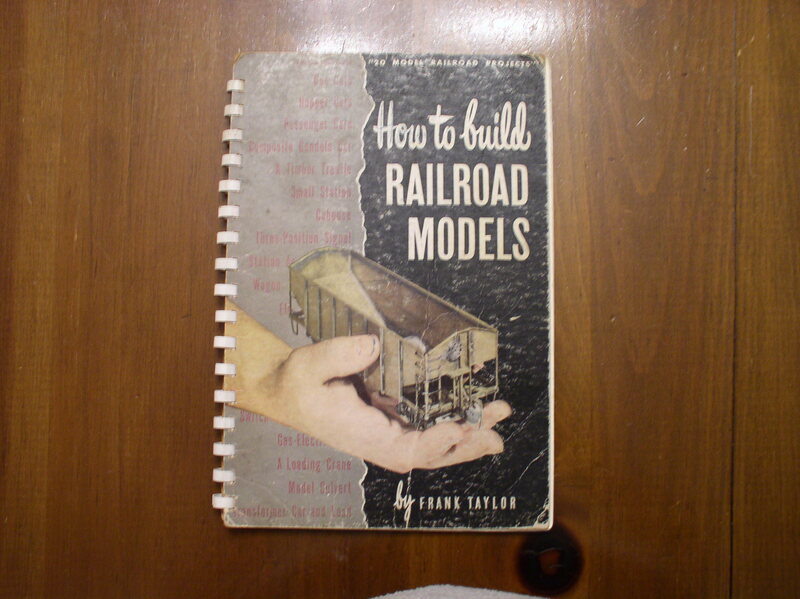 This book is amazing in what the author-model builder was able to accomplish. I think it is pertinent today in this age of lost skills or unwillingness to try something new because we can’t buy it. 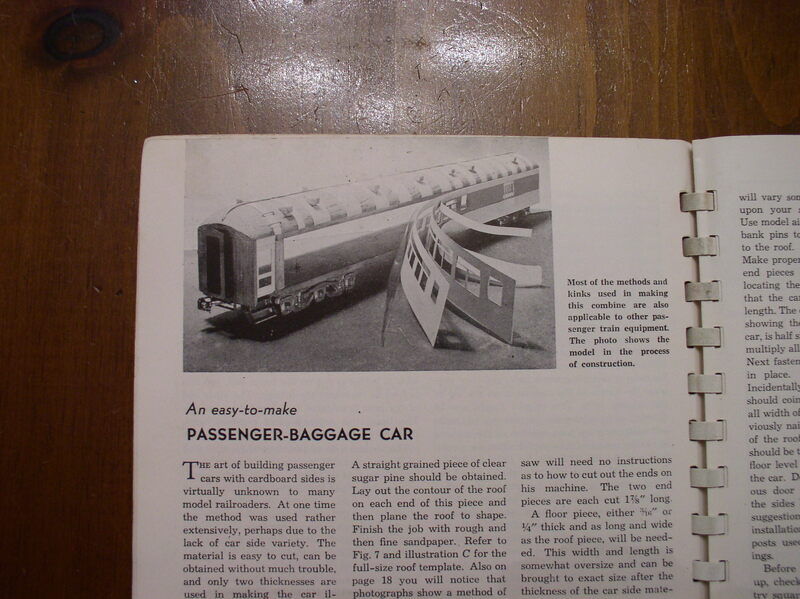 A wood body – laminated card stock sided passenger car. 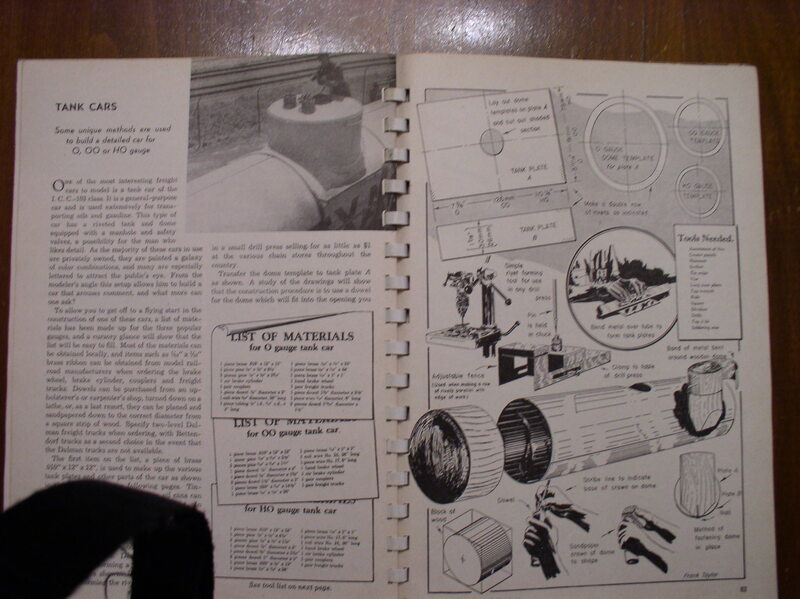 An operating semaphore with instructions to how to build the electric coils. 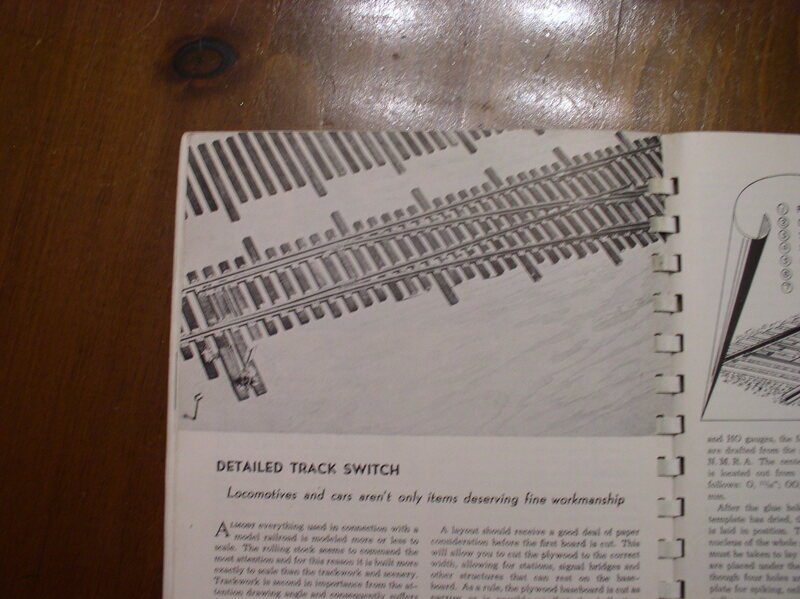 A fully detailed track switch with tie plates. An operating switch stand along with an indicator and an electrical switch box to indicate position remotely. 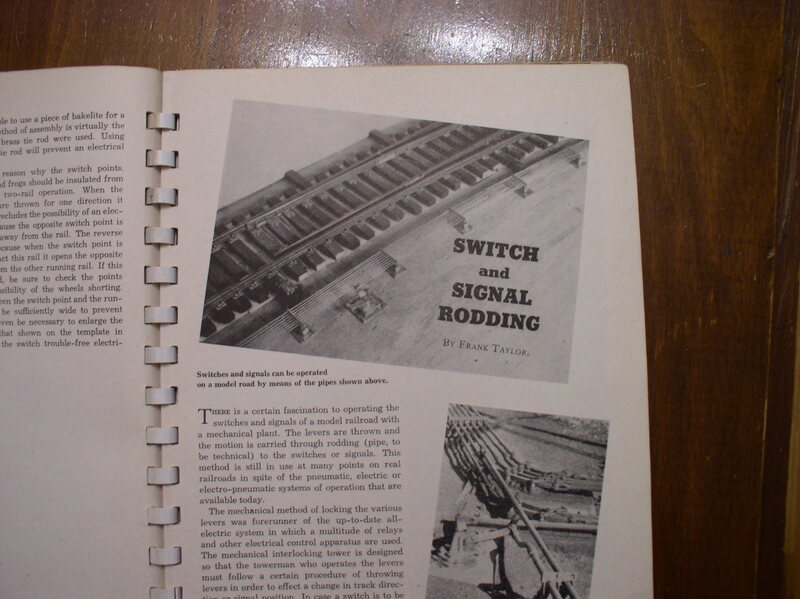 An article on how to make your own switch and signal rodding for interlocking. How many have seen this kind of modeling today? A wood tank car body overlaid with riveted brass and soldered together. 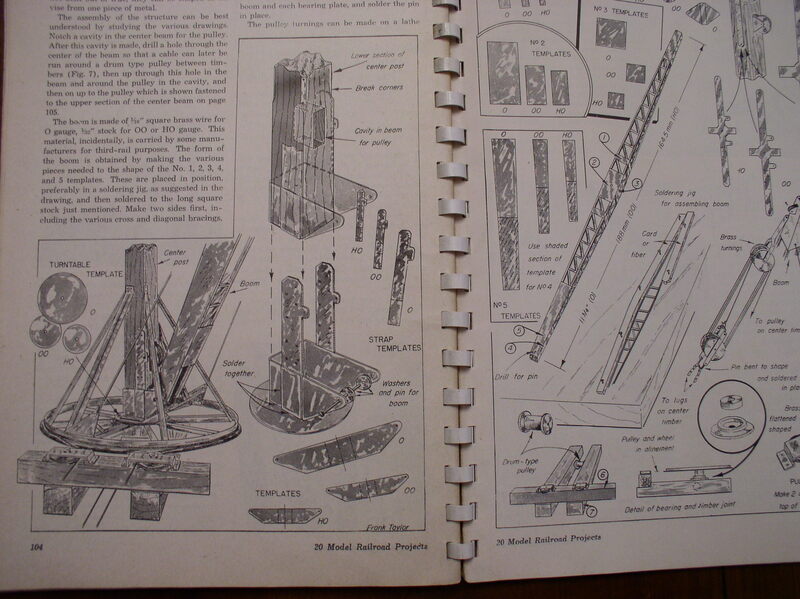 A working large wooden jib crane such as you would find in a granite finishing yard. And, there are more including a gas electric, box cars and reefers, a road crossing with gates and a shanty, and so on. If you ever see a copy of this little book, grab it. It is very inspiring and answers many questions about starting and completing various model projects. 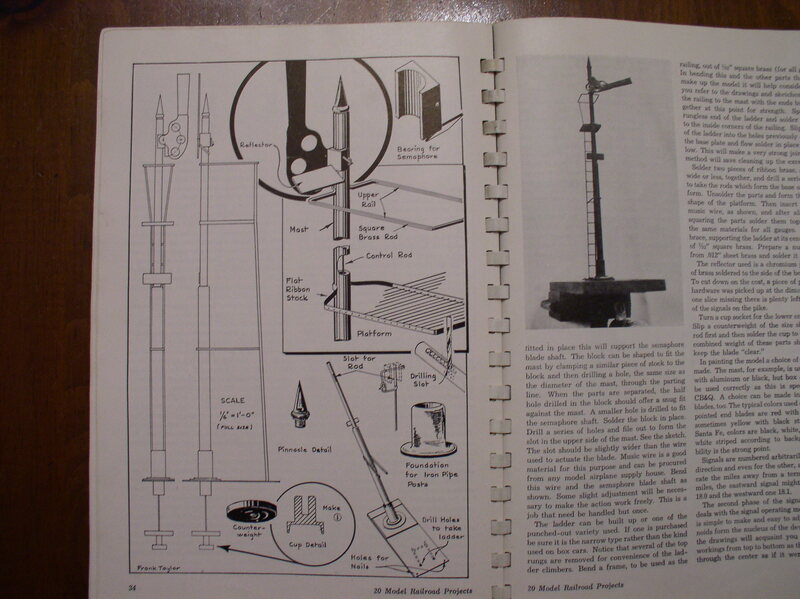 It is also very humbling to know that this kind of detailed and clever modeling was going on 7 decades ago. Next week I hope to be back working on the railroad. Perhaps I’ll write again then. 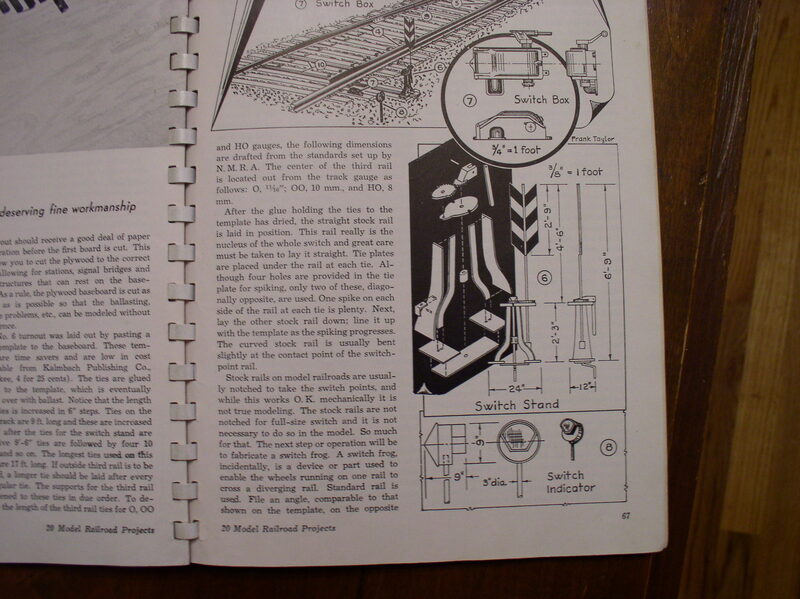 Some forty years ago when I built my former railroad, the materials and methods were tried and true. With this new railroad, I have determined that I will take advantage of recent material developments and learn some new skills in the process. It is simply part of the enjoyment. Immediately I noticed that I am no longer horsing around 80 pound bags of Structolite. A welcome relief for sure. The new method in this case is plaster impregnated gauze cloth. Just dip in water and lay it over the scenery form base. Smooth it out with your finger and it is done. Very neat and clean compared to troweling on creamy plaster. Underneath the plaster cloth in this view is what is called dry florist foam. This material is easy to cut and shape. It has little strength on its own. 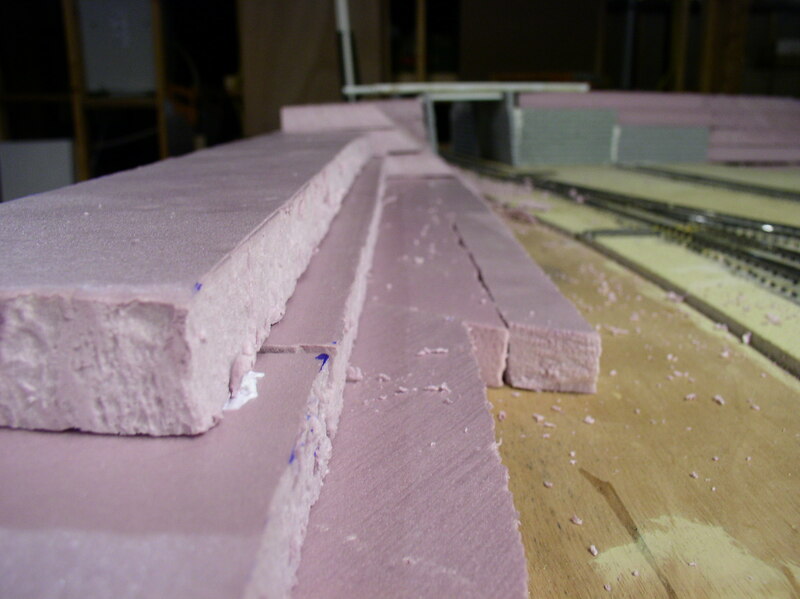 I glue cut blocks of this material with Loctite’s Poly Seal. 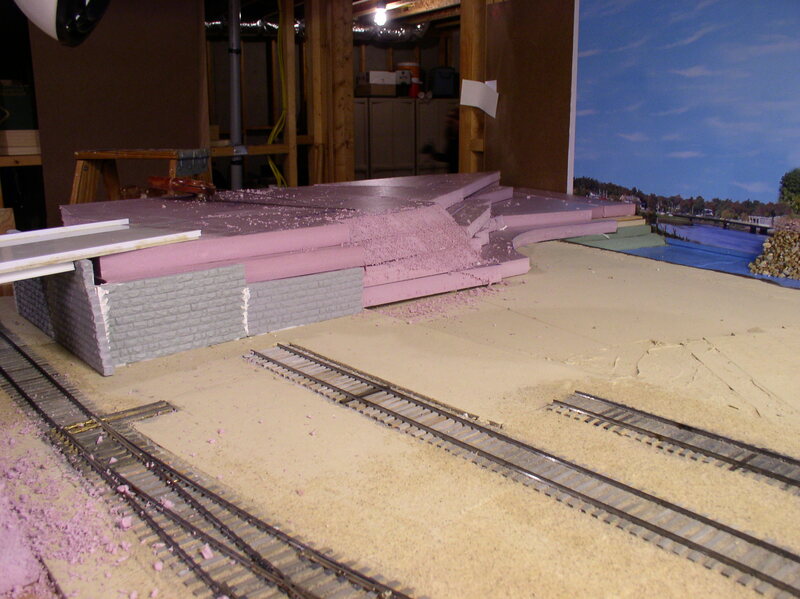 This particular foam has become quite popular with some New England modelers who I am acquainted with. One of the advantages in addition to shaping is that if the ground cover is spread thin enough, trunks of trees can be poked into it with out drilling and will stand without gluing. 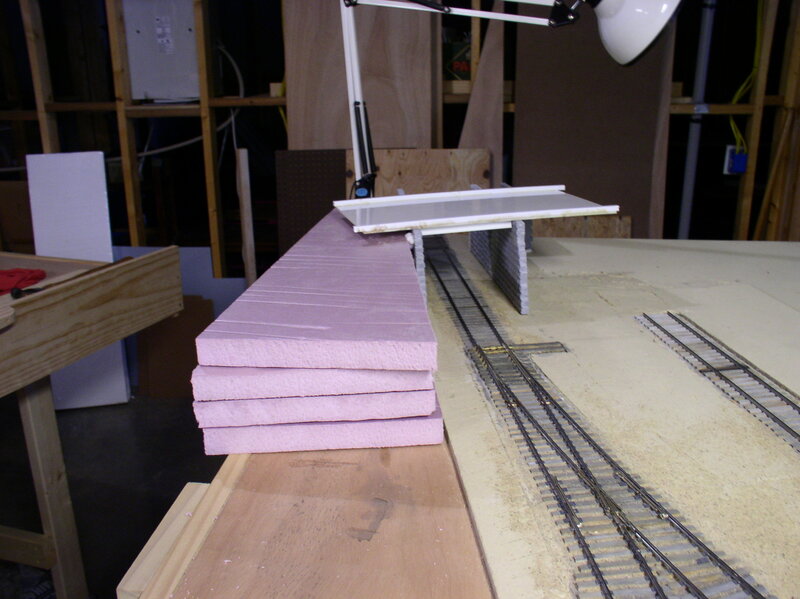 To shape the foam, I made up a couple of boards, 3″ wide and 1″ wide and covered them with #80 coarse sand paper. The foam is so weak, those two boards are expected to last the entire construction period. Again, this is the dry foam which is used to make floral arrangements by just sticking the stems into it. The other florist foam is called wet foam and made for immersing in water. It is much denser which is not needed for modeling purposes. The I have begun trials with what has been called “ground goop”. There are a number of variations in the recipe, but mine at the moment is equal parts of Celluclay, vermiculite, a little water, and some cheap brown latex flat paint for color. Others also cut in a bit of white glue which I will try next time around. Put the Celluclay and the vermiculite in a plastic bucket, mix them dry and then start to add water. Mixing is done by kneading, or continuous squeezing until the mixture is completely wet out with nothing dry showing. Then I add some paint for color and adjust the final mix by adding more dry ingredients. This is obviously messy with the need to good fitting disposable gloves. Then take golf ball size gobs and begin to spread it where desired. Fingers work very well here at this stage. It’s like being a kid again and playing with mud. 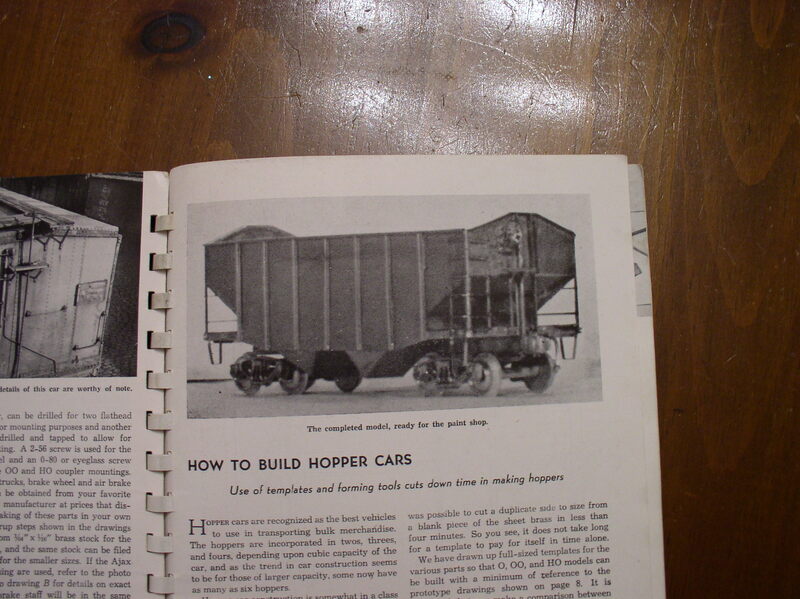 If you are interested in trying some of this I recommend looking up the “Railroad Hobbyist e-magazine. Find the articles by Mike Confalone on his scenery outside the box. There is also a video available which demonstrates clearly some of these recent techniques. A few hours were available this weekend, so I took advantage of them. Work continues on the CN reefer ‘fleet’ of two cars. The 8-hatch is primed and in the paint shop awaiting the color coat. The mechanical reefer is in the loft shop getting detailed. It, too, is almost ready for priming. Priming of this model will be a two stage process because of the need to add Archer rivets in between stages. 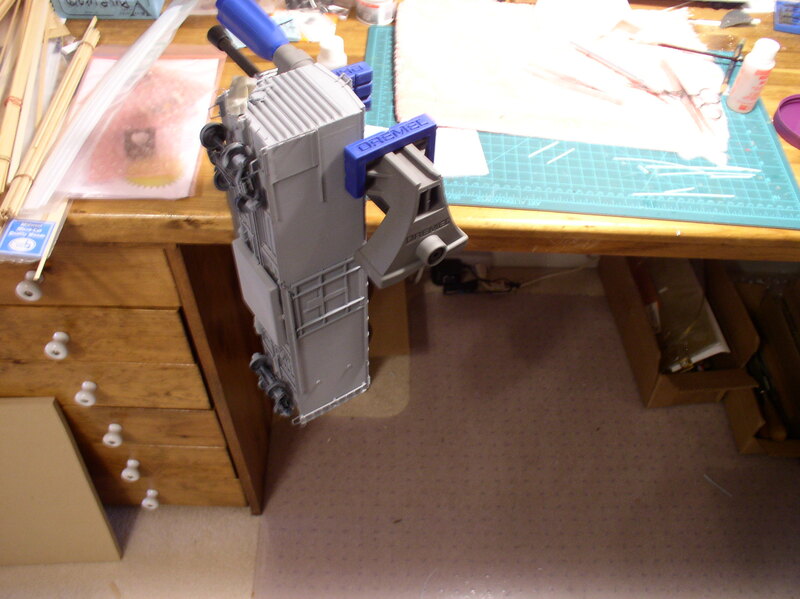 The first photo shows the basic body. Ultimately the sides will be rivet intensive. Each vertical body seam is riveted, therefore after the body is primed the Archer rivet decals will be applied. I expect to be expert by the time this car is completed. The 8-hatch only had two small panels over the doors that had rivets applied. The plug door is a part from Weaver. On the left end is a sliding panel for access to the refrigeration unit. This sliding panel and the body panel above it will have louvers installed. Again, this will be an Archer product. Prior to the CN cars I had not used the Archer products, but already I am a fan. 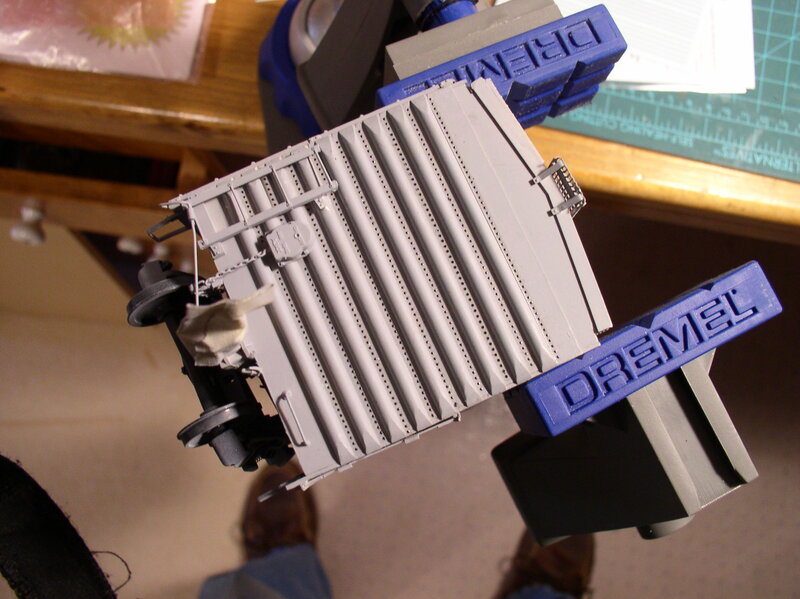 The underframe is receiving the necessary components in this view. The brake gear has been plumbed and the fuel tank installed. This is an end view of the corrugated end being formed. Here again rivet strips will be applied between each raised corrugation. I am fortunate that this model has straight horizontal corrugations which obviously save a lot of work, otherwise I would probably be facing cutting and sectioning commercial brass ends to get the right pattern. This final view shows the necessary Canadian 8-rung ladder installed. These are very nice castings from Protocraft. With the exception of priming the first coat on this car, I will probably get back to work on the railroad itself next week and stop the model work for awhile.